The endlessly talented and prolific Jennifer Brozek just launched her first podcast and it’s great. 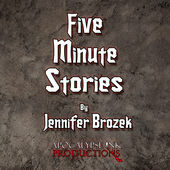 Five Minute Stories adapts some of her numerous flash pieces into audio fiction, and the first two episodes released are classic examples of why she’s so good at what she does. Cassandra’s Younger Brother is a quietly heroic story about what happens when a seer’s abilities collide with their day job in insurance. It’s gentle, precisely realized stuff that manages that most difficult of feats; heroism which is neither loud or overblown, but no less heroic for that. Dust Bunnies follows a house inspector on his way into a derelict building. But derelict doesn’t mean deserted. A neatly executed, nicely fanged story with a great ending it sits next to one of my all time favorites, The Dionaea House, as a great example of the ‘spooky house at the end of the street’ sub genre. Five Minute Stories’ first season will run for 13 weeks and its absolutely worth you time. Likewise, you can find the stories being adapted and many more here, and Jennifer‘s twitter account here.